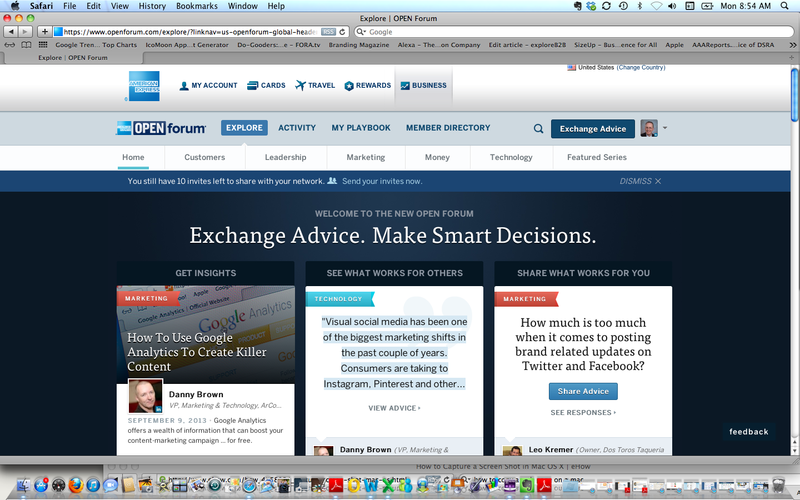 American Express OPEN Forum is a great example of successful Content Marketing. In his book “Epic Content Marketing”, Joe Pulizzi defines Content Marketing as the marketing and business process for creating and distributing valuable and compelling content to attract, acquire and engage a clearly define and understood target audience – with the objective of driving profitable consumer action. Content marketing is a strategy that focuses on the creation of a valuable experience. American Express understands the importance of a brand publishing useful content for their target audience. They have become a “trusted authority” for small business owners. OPEN Forum is an online community of small businesses hosted by American Express. Members use OPEN Forum to exchange insights, to get advice and expand connections. Open Forum helps business owners make smarter decisions. The mission of OPEN Forum is to provide small business owners information, education and connection. OPEN Forum is a community with content at its core. OPEN Forum was launched in 2007 as a digital home for live events where small business owners gained valuable information while networking with each other. In 2008, during the middle of the recession, OPEN Forum established itself as a blog for small business topics. OPEN Forum partnered with industry leaders such as Guy Kawasaki, Chris Brogan and Ann Handley of MarketingProfs to post expert content. This approach helped OPEN Forum build credibility. The idea for Small Business Saturday came from this community. The site’s content provides useful information that small business owners want and need. Popular topics include productivity, business management and finance. The site is aimed at small business owners who are time pressed and in constant search for ways to improve their business. The site focuses very clearly on their needs with insightful content in multiple formats such as videos, infographics, blog posts, articles and audio. It also attempts to be helpful with practical tools, how to content, marketing tips, and latest industry forecasts. The site has user-generated content but also content from publishers. American Express has seen positive returns from OPEN Forum. American Express OPEN is the leading payment card issuer for small businesses in the United States. American Express OPEN Forum has over 1 Million monthly unique visitors. 85% traffic comes from unpaid sources as readers share the content with their own social networks, bringing back more visitors. Their number one goal to drive people to small businesses. They understand that if small businesses keep growing they will be successful as well. The business goal is to increase brand awareness and sign-ups to AmEx products, American Express intentionally do not publish self-promotional content. Don’t use content to sell, establish yourself as a “Trusted Advisor”. Leverage experts outside your organization to provide relevant content. Commit for the long haul – Content Marketing is not a campaign but a long-term effort to engage your audience. Can you think of other brands who are doing a great job of Content Marketing?